A straight left wrist at impact is important for right-handed players. In the golf swing, one of the key factors in where the ball will go is the position of the hands at impact. For right-handed players, understanding the role of the left wrist during a swing can help golfers hit straighter shots with more distance. There are several drills that can help golfers properly utilize their left wrist in the swing. The proper use of the left hand starts with a good grip. Golf grips are unique to each player, and can depend on whether a player has the ability to compensate for a weak or strong grip with other aspects of the swing. For right-handed golfers, the "V’s" formed by the index finger and thumb on each hand should point between the golfer’s chin and right shoulder. The grip also should be relaxed, which will help the left wrist get to a straight position at contact. During the swing, the left wrist rolls over as the golfer transfers from the takeaway to contact and then the follow-through. If the wrist rolls too forcefully, the shot likely will hook to the left. If the wrist does not roll enough, the shot likely will slice to the right. To practice rolling the left wrist correctly, place a ball on the grass on the driving range and place both feet together. Begin the backswing, and stop at waist height. Begin the downswing, hitting the ball and rolling the wrists before stopping the swing at waist height. At impact, a right-hander’s left wrist should be facing the target. A good way to check the position of the left wrist is to see where the logo on a golf glove (if one is worn) is pointing at contact. To practice getting the wrist in proper position, use a wedge or short iron. Turn the club around and grip it by the clubhead with only the left hand. The club’s grip should be near the ground. Take a swing while holding the club with only the left hand. The club will make a swishing sound as it comes toward the impact point, but at the point where impact would be made take note of where the back of the wrist is facing. It should be facing the target. 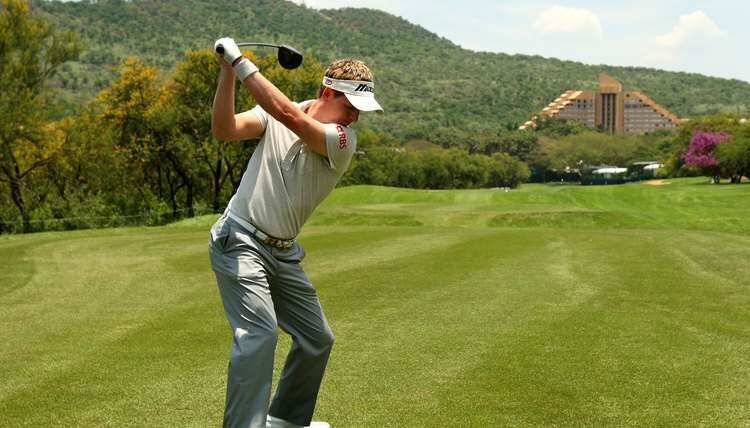 What Are the Five Essential Golf Swing Basics? What Do I Do When I Slice in Golf?